Mountain Forest Honey gives this marmalade a rich floral essence, and is a great way to boost immunity during the winter months. Satsumas (packed with Vitamin C) are in season for just another few weeks here in northern California. Enjoy them both in this flavorful, low-sugar jam inspired by award-winning Chef Sean Brock from his Heritage cookbook that celebrates his Appalachian roots. Sterilize jars and lids as shown here, or run though dishwasher and leave until ready to use. Smaller jars, such as 4 oz. or 8 oz. are recommended. Place two small plates in the freezer for testing the marmalade later. 1. With a vegetable peeler, trim off the outer layer from the rind of 2-3 satsumas. If there is pith on the inside, scrape it off with a knife and discard. Cut the rind across the short side into very small strips and then in half again for about 1/4 cup. 2. Peel the rest of the satsumas and put in a bowl. In another bowl, save the juice by slicing the segments in half and squeezing them with your hands. Put the remaining segments in another bowl, removing the membranes of the segments as best you can and discard. The rest will filter out in the food mill at the last step. Set the juice (1 to 2 cups) and segments aside. 3. In a medium pot, heat the honey to just under a boil. 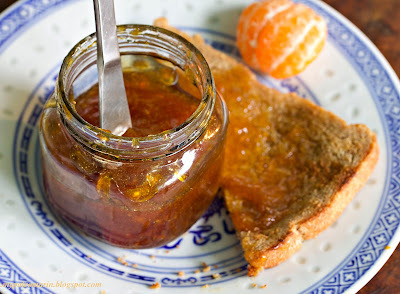 If you like a stronger "burnt" flavor like Brock, cook the honey for up to 10 minutes (color of jam in jar above). I made the jam twice, and preferred 5 minutes for a lighter taste and color (more like the jam on the toast). Just stop when it tastes good to you. 4. Add the satsuma juice and segments to the pot, and heat through at medium-high heat. 5. Mix the sugar and pectin together in a small bowl. When the honey and juice mixture is warm but not boiling, add the sugar and pectin a little at a time and stir. 6. Continue stirring the mixture for about 15 - 20 minutes. The color will turn darker and the jam should coat the back of a spoon. The temperature is supposed to rise to 240 degrees F, but mine did not go that high. Turn off the heat, and test to see if the jam has congealed on one of the plates in the freezer. If not, cook a a little longer. If you get any lumps from the pectin, they will come out in the next step. 7. Put a food mill over a bowl and pour in the cooked jam. Process it through a large-holed sieve. It will be thinner than the final product at this point. Scrape off the marmalade from the bottom of the sieve into the bowl. Ladle the jam into sterilized jars and add lids and screw tops. Put the jars in the refrigerator to cool. The jam will gel in about 3-4 hours. 8. Store jars in the refrigerator. If the seals are tight, the marmalade should be good for a few months.